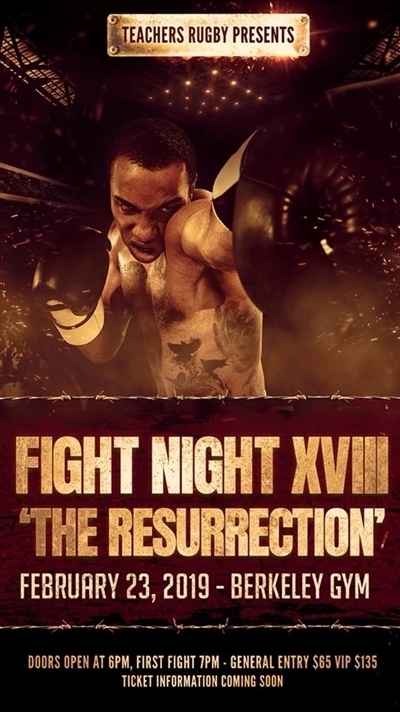 Teachers Rugby presents Fight Night XVIII THE RESURRECTION. Teachers' Fight Night is the longest running and most prestigious boxing event in Bermuda. A full fight card is now in place including the biggest names in Bermuda boxing and the traditional rugby club grudge matches alongside football and hockey. It promises to be another epic night. With limited capacity it is important to get your tickets purchased in advance as a sell out crowd is expecting. Tickets are offered for VIP including open bar and gallery views as well as the regular ringside options.